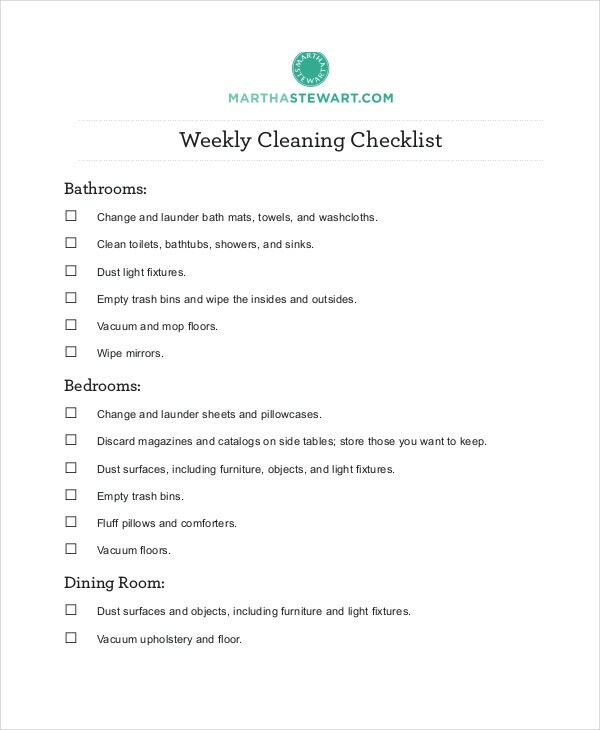 With the holiday season just around the corner, it’s time for major clean up of your house. 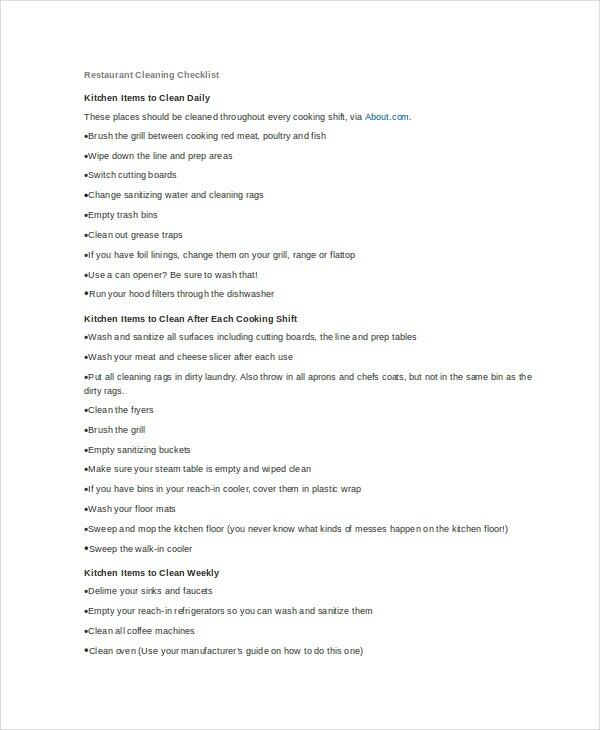 But cleaning itself is a huge job and more so when it involves huge space and lots of rooms. 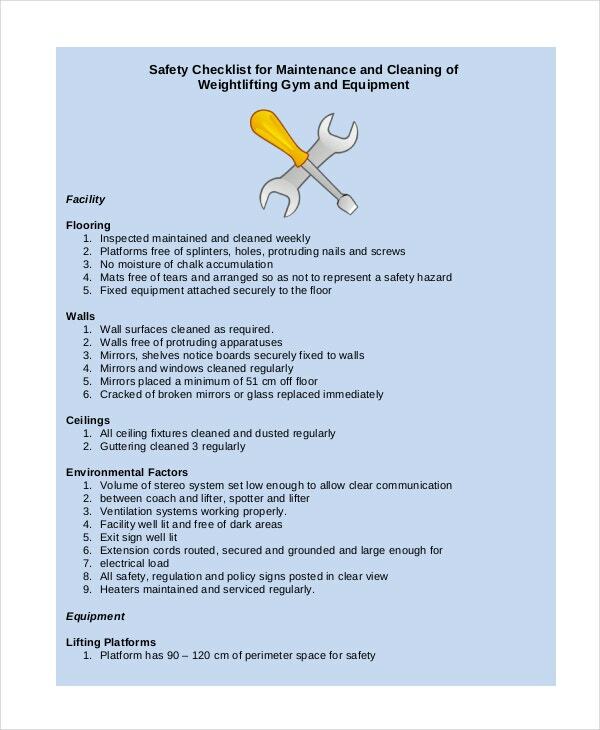 In fact, you might end up missing out on one or two places if you do not proceed in a planned way. 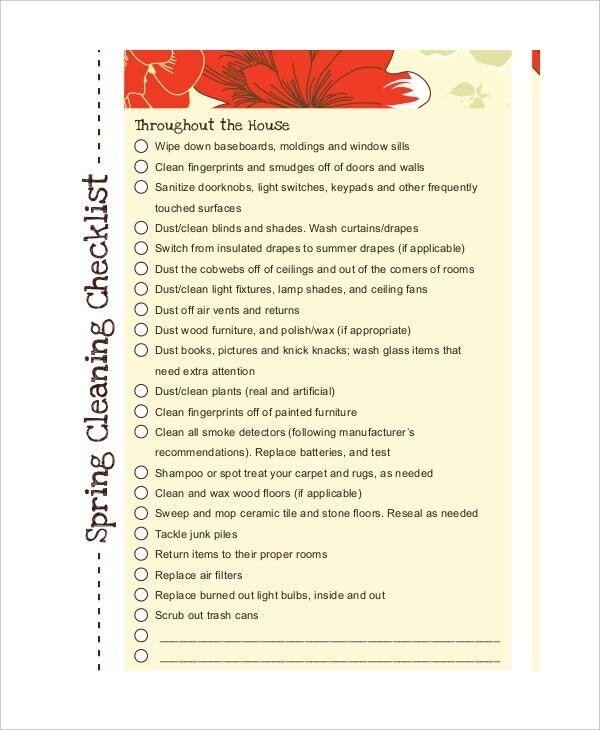 But you can avoid all such stress here by taking to a cleaning checklist template. 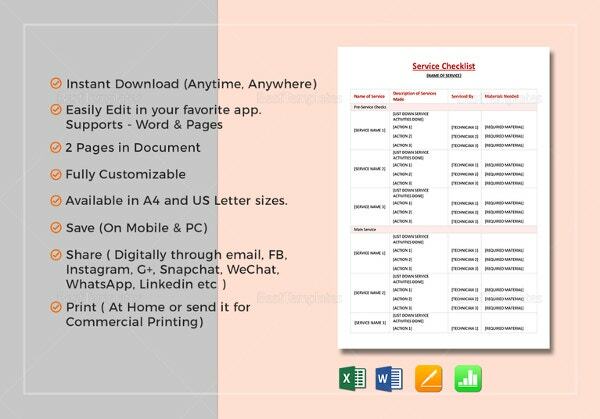 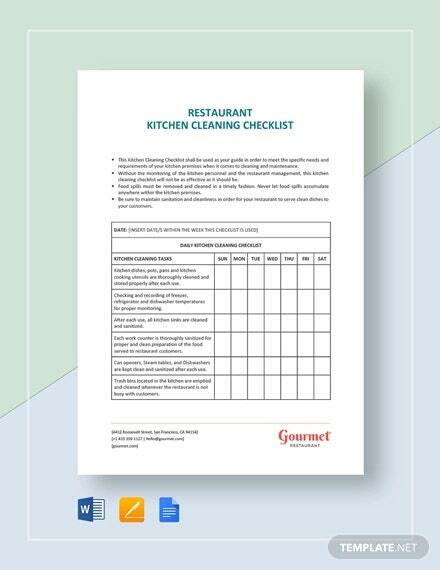 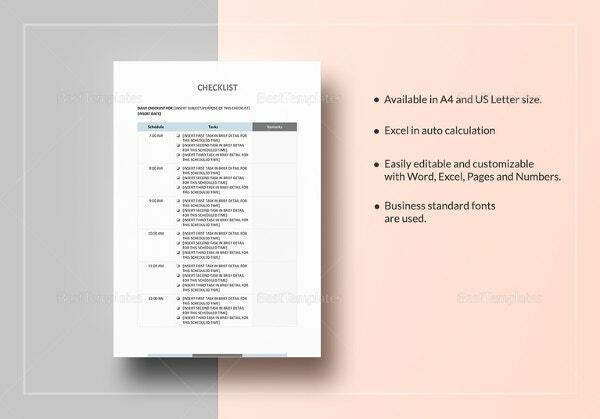 Such checklist templates help you to keep track of your cleaning project and ensure a systematic approach. 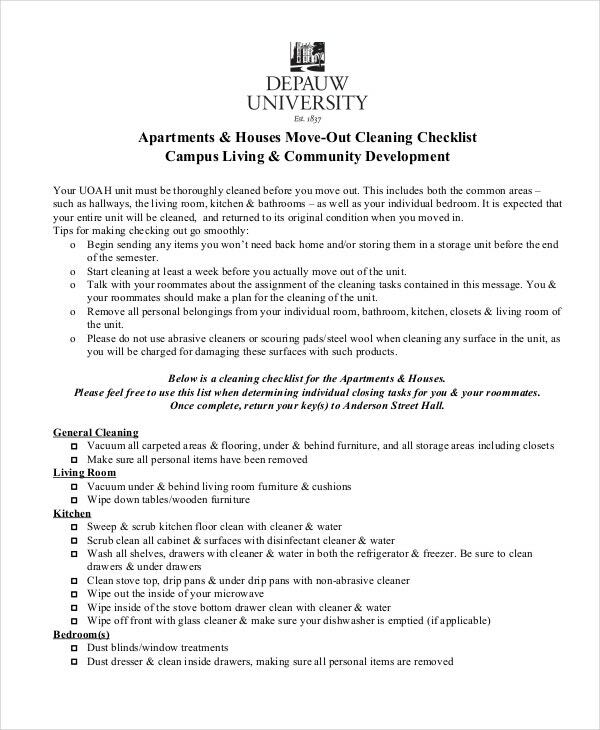 If you are about to move out of your apartment soon, this cleaning checklist here would help you to perform the needed cleaning tasks in your apartment in an efficient manner. 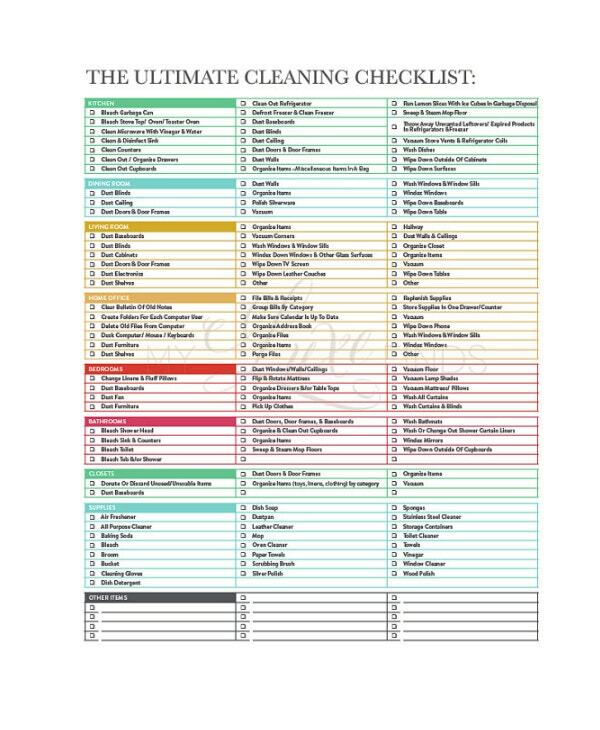 It has listed all the aspects to be cleaned so that you don’t skip out any. 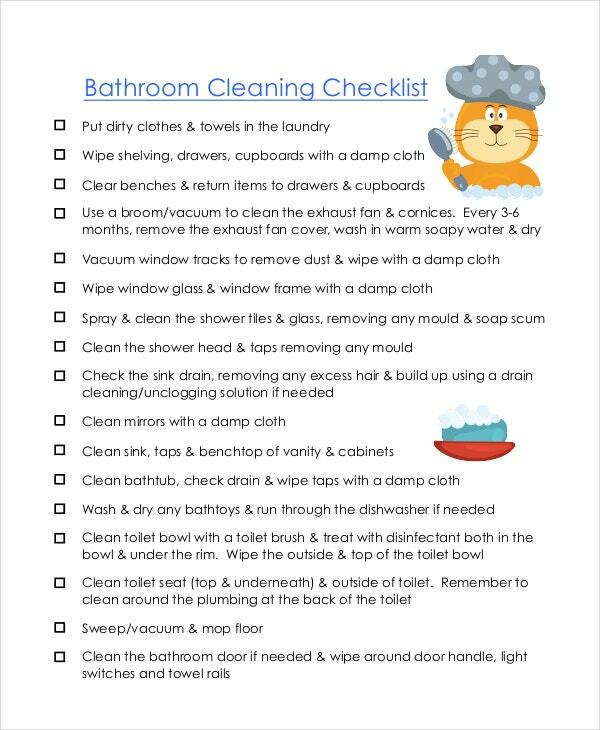 If bathroom cleaning feels overwhelming for you, this bathroom cleaning checklist would be handy as it has listed down all the major and minor areas of the bathroom to be cleaned. 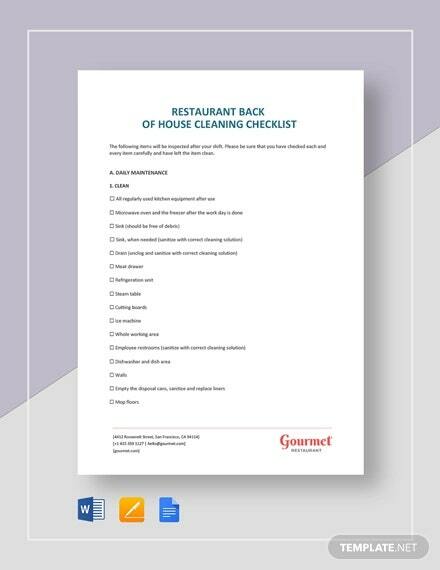 You have a very smart daily checklist for cleaning your new home here and the USP of this template is that it comes neatly segregated into separate sections meant for each of the individual rooms of the house. 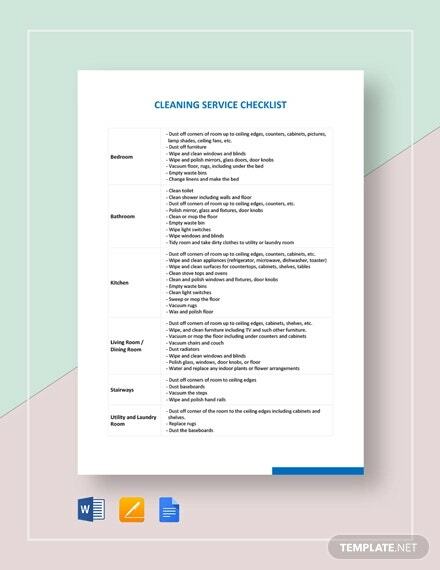 This is your ultimate gym cleaning checklist in the sense that it not only lists the areas and places to be cleaned but also helps you with a complete list of cleaning and maintenance supplies. 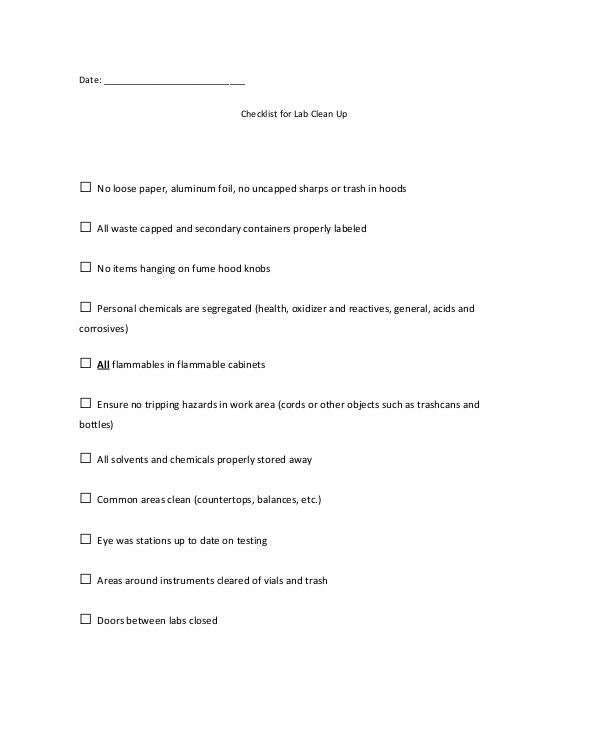 > Who needs a Cleaning Checklist? 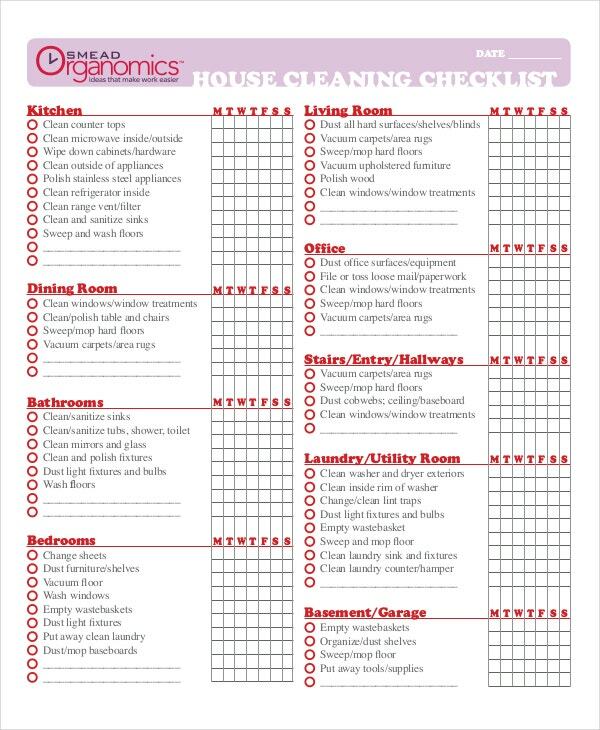 A cleaning checklist would be really useful especially when it comes to big cleaning tasks. 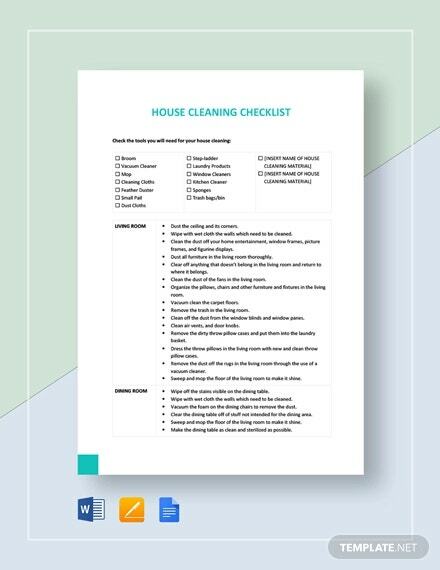 It could be that you have decided to clean-up your entire home before the upcoming in-house party and there are so many areas to clean. 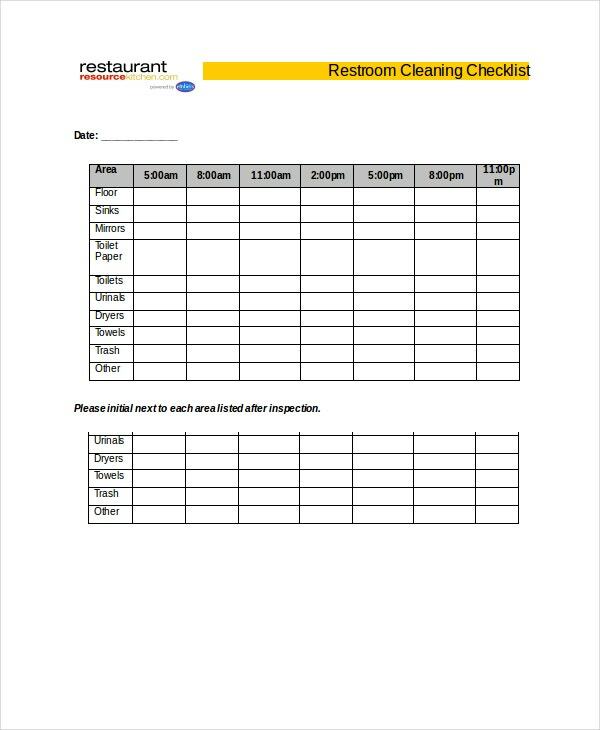 A cleaning schedule template here will show which aspect of which room is to be cleaned when. 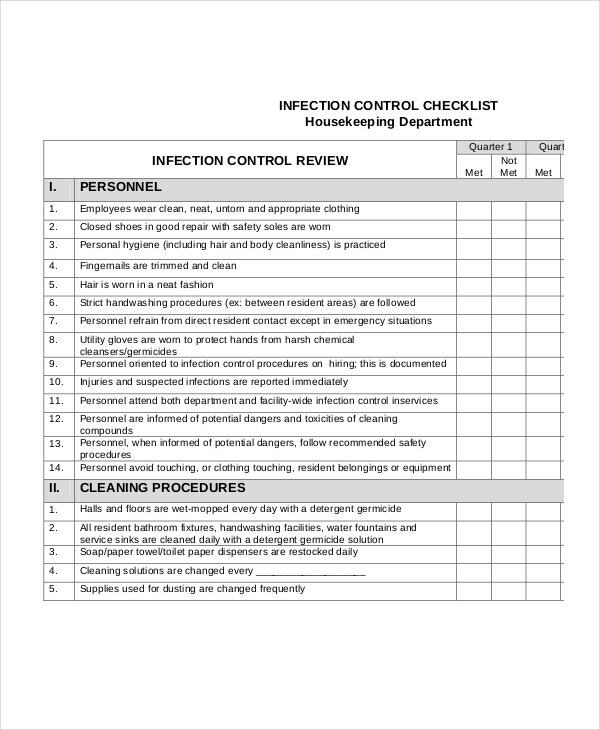 Then, such a checklist would also be handy for those responsible for cleaning commercial spaces such as offices or gyms and so on. 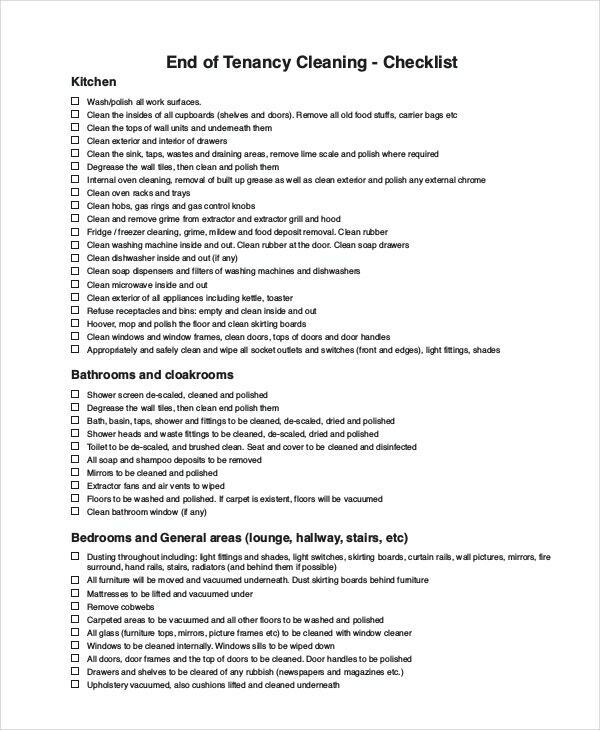 Besides, if you have plans to move out to a new place from your rented apartment, you will need a checklist to understand how to leave the rooms clean and clear. 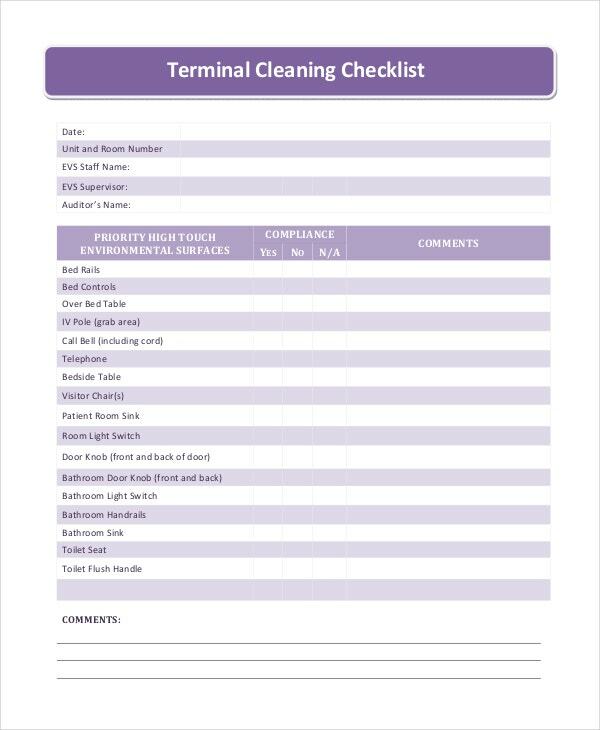 This living room cleaning checklist would be cool when you are moving out of an apartment; it offers a detailed description of what to do with all the items of the living room to ensure a spick and span ambiance before you leave. 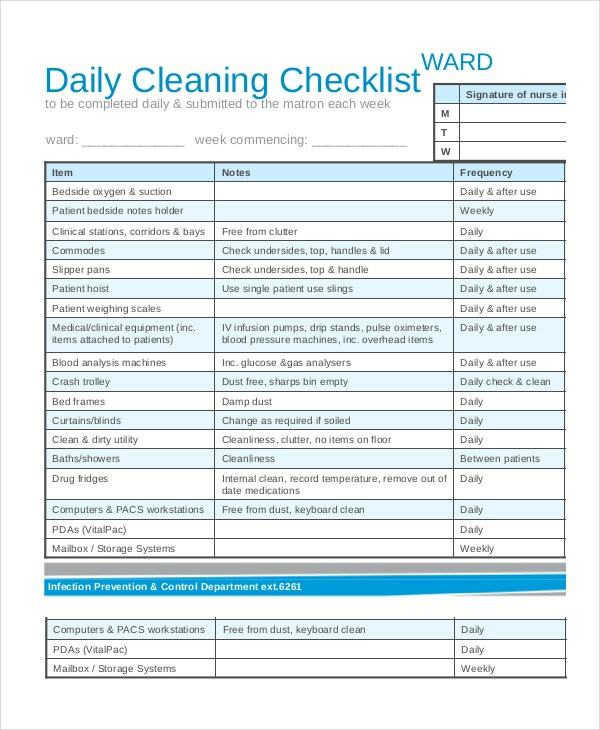 > What is the importance of a Cleaning Checklist? 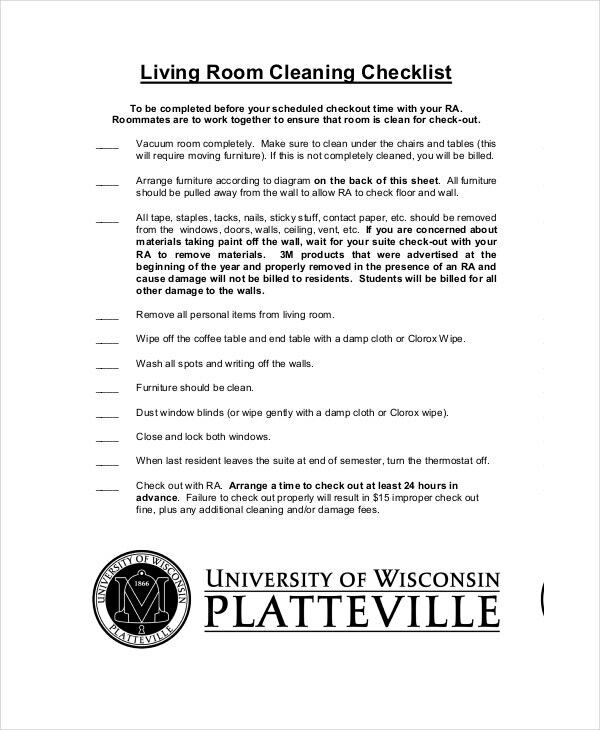 Cleaning a place can be really overwhelming at times. 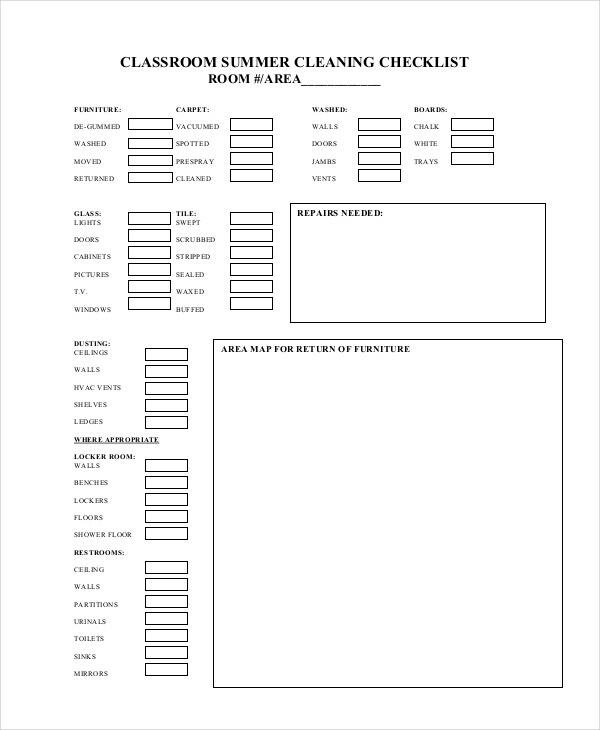 There are so many things to do and it’s not uncommon to unmindfully skip out on one or two areas in midway. 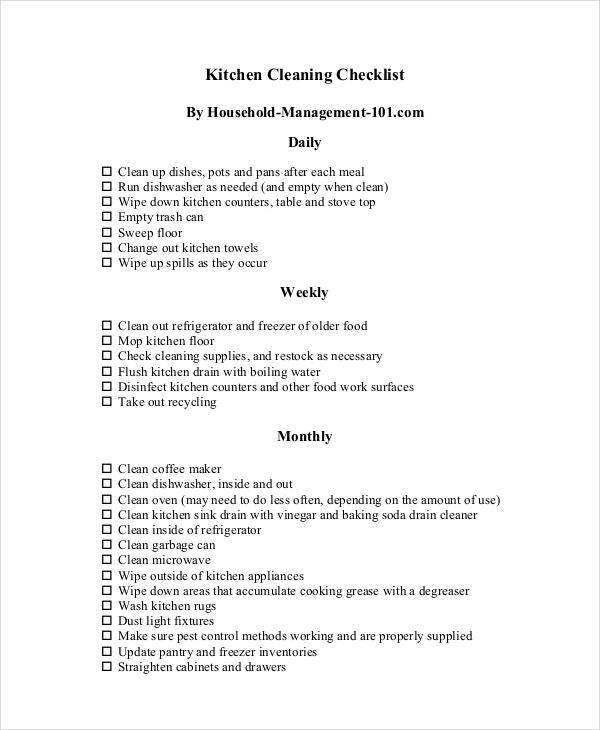 But a cleaning checklist helps to avoid all such woes by providing you a list of all the things to be cleaned in your cleaning project. 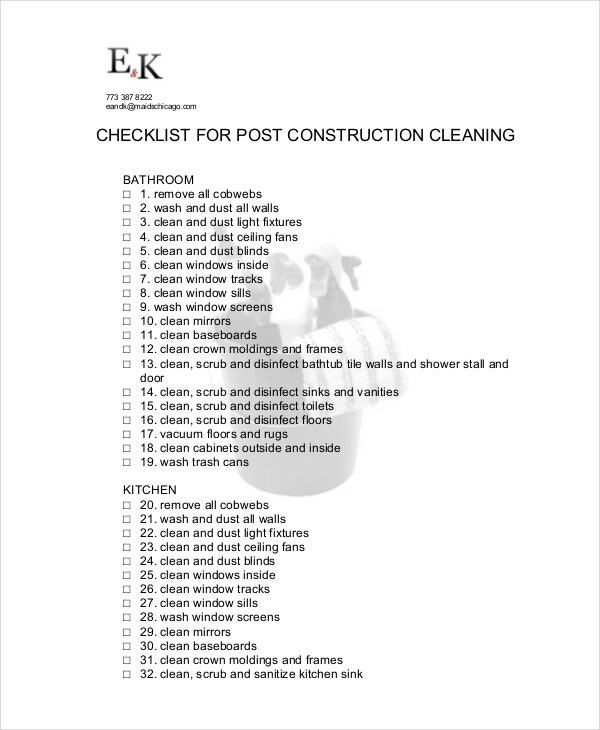 There are checkboxes beside each cleaning task which you can tick once you have finished cleaning the area. 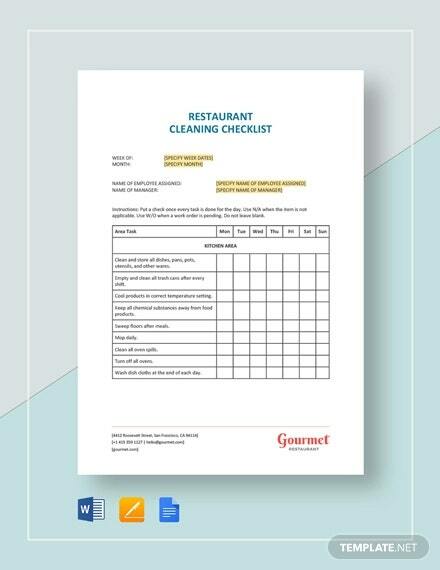 Thus, in case, you feel like you have forgotten something, you can always have a look at the maintenance checklist to check whether or not you have missed out on something. 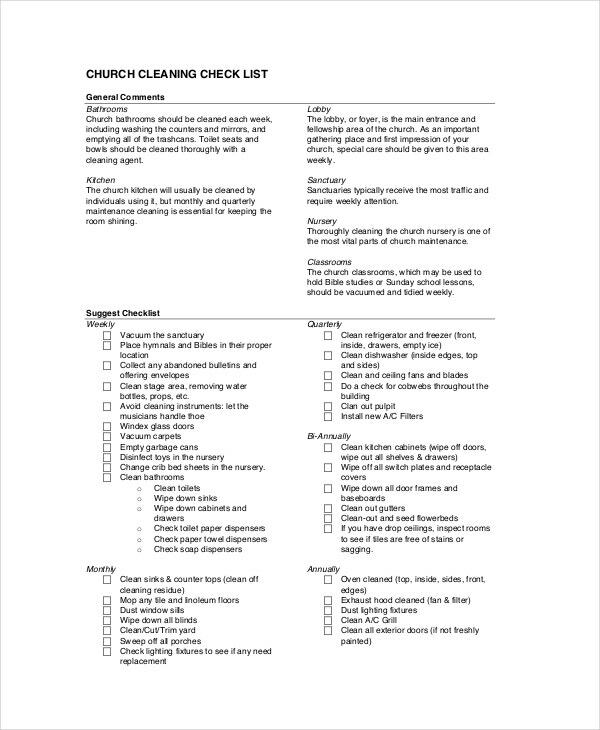 You can also see Maintenance Checklist Templates. 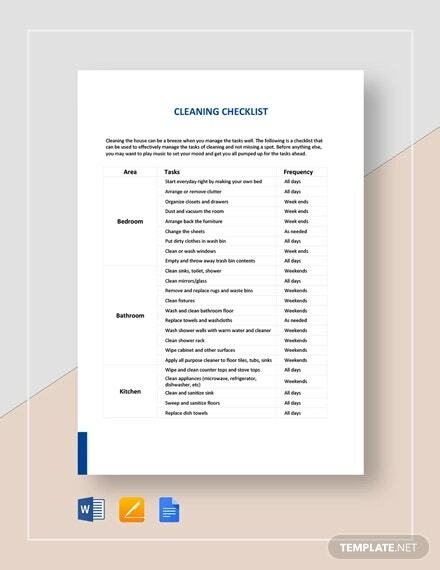 If you are looking for ideas on how to create a cleaning checklist, the templates mentioned above are all that you need. 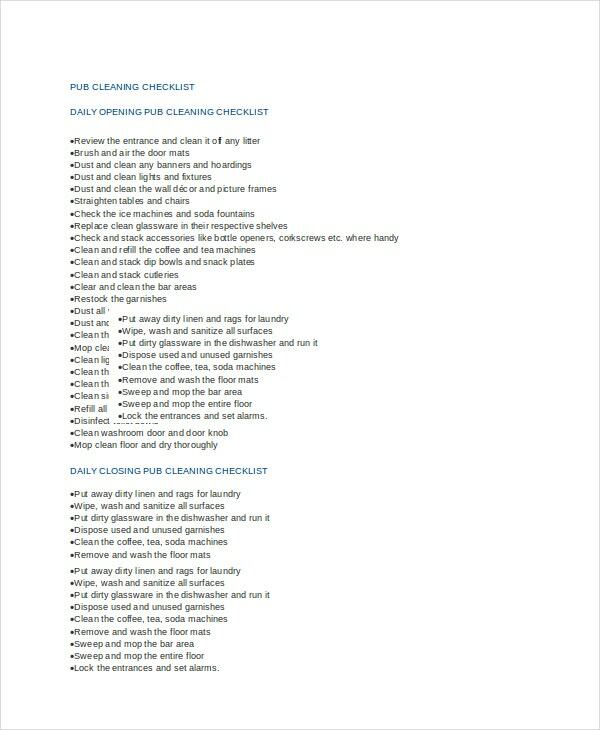 They cover a wide range of cleaning checklists including full home cleanup checklists to make the job easier for you. 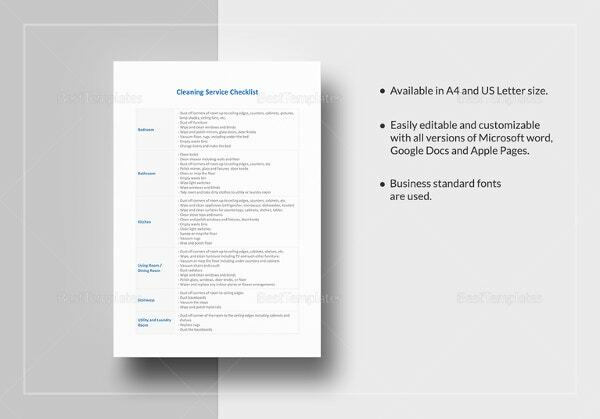 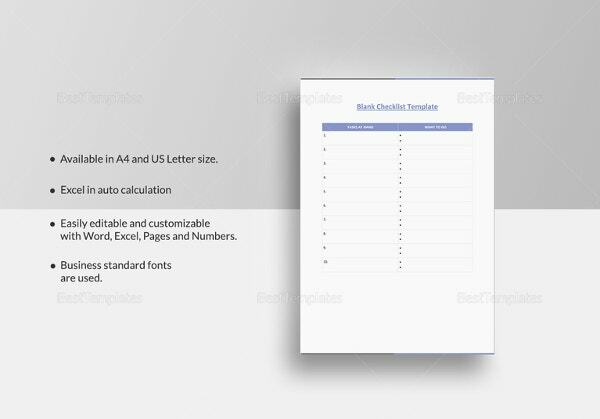 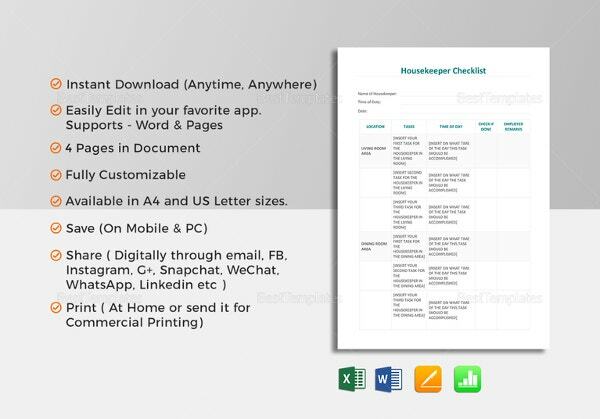 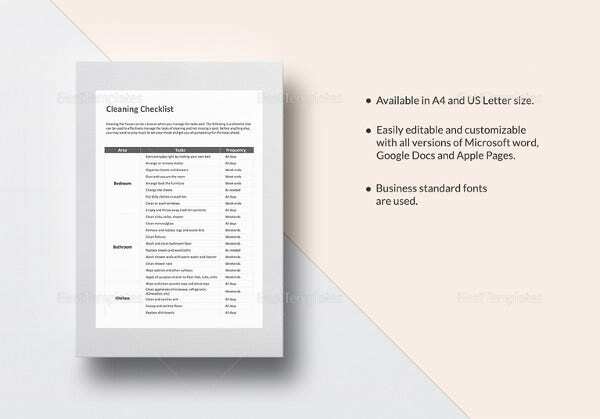 You would simply have to download, customize, and print out a suitable template.